How to use an engine hoist - A simple guide! Home >> Blog >> Engine Hoist >> How to use an engine hoist – A simple guide! The engine is the most important part of a vehicle, and if you’ve stumbled onto this page there is a good chance that you need to temporarily remove it for one reason or another, by using an engine hoist. The engine may need to undergo repair, maintenance, replacement, or cleaning. Before hoisting the engine, you will first need to make certain that it’s fully disconnected from the transmission, that the wiring is removed, and that the engine is completely free from anything else that it was connected to. Just as its important for your mechanic to take measures that will ensure they are safe from harm, its even more important that you use protective gear when using your engine hoist. The following list is a short guide of some of the Personal Protective Equipment (PPE) that you should have available, or at the very least consider it’s use in your specific situation.. Protective gear for the eyes, for instance face masks and glasses. How do I know how much I can lift? It is absolutely crucial that the weight rating prescribed for the crane/hoist, is greater than the engine to be hoisted. You can generally find this information on the arm of the hoist. If not, it will be written somewhere else on it. This is very important as engine hoists can range from .25 ton to upwards of 20 ton. To prevent accidents, you need to make sure that the lifting attachment is sturdy enough to hoist that engine. The sling/steel cables to ascertain that they are in perfect working condition. They all need to be strong enough so as to support the weight of that particular engine to be hoisted. The sling also ought to be long enough such that when the engine is hoisted, the angle at the top is approximately 45 degrees. 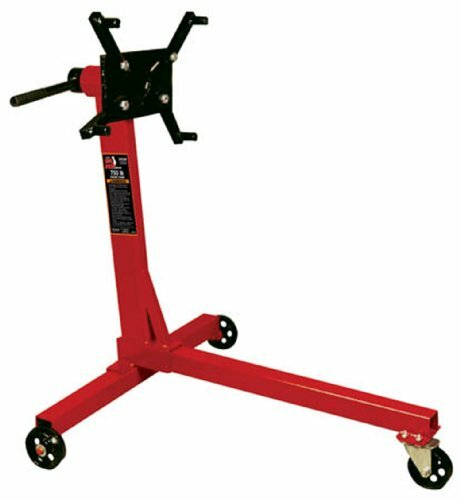 You could also consider the purchase of a load leveler such as the one below (click on the image to read more). Just make sure that the load leveler you purchase is rated for the amount you want to lift. When setting the engine up for a hoist, you should look for a spot at the back of the engine, where part of the chain can be attached with a bolt. Typically, this will be at a point that is sturdy enough, such as the intake manifold, or the exhaust manifold. You should then find another spot at the front of that engine, where another section of the chain can be attached to with a bolt. This spot should ideally be in opposite direction to the other bolt, ensuring that when the engine is finally lifted, it will be level, and not lean on any side. Once you have your chain in place, make sure that it is loose enough that the engine hoist can hook onto it without damaging the top of the engine. The chain process can also be repeated on the other side, effectively forming an X shape across that engine. You then need to make an adjustment to the hoist, to ensure that the correct weight to hoist the engine is set up. The hoist should then be hooked to the chain, so that it is centered. The weight of the engine must be balanced well across the chains. The mechanic should then jack that hoist up, effectively raising the engine. This should be done slowly and methodically, to ensure that the engine is still not attached to any wiring that was not detached by the mechanic. Then hoist up the engine away from the engine bay and vehicle, then slowly lower the hoist towards the ground, and finally place it (the engine) on the intended surface. When the engine has finally been lowered to the ground (or onto an engine stand similar to the one below) the hoist should be completely lowered, and then disconnected from the engine. What else do I need to know about how to use an engine hoist? 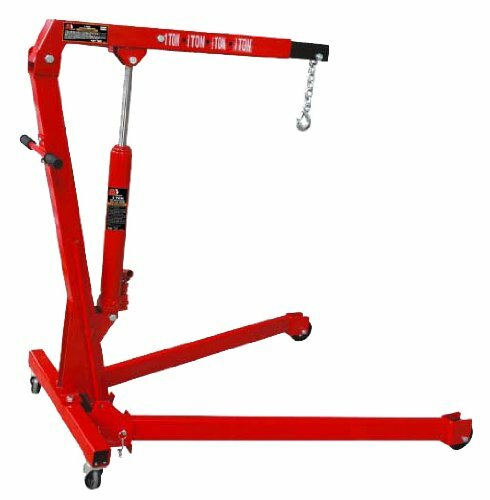 Floor cranes have great capacity to lift objects with heavy weight, and are therefore ideal for lifting engines. A hydraulic cylinder enables the lifting arm to move, and the length of this arm can be adjusted. If the length of this arm is increased, its capacity to lift is reduced. One should check an arm’s weight limit, which is clearly indicated on it. 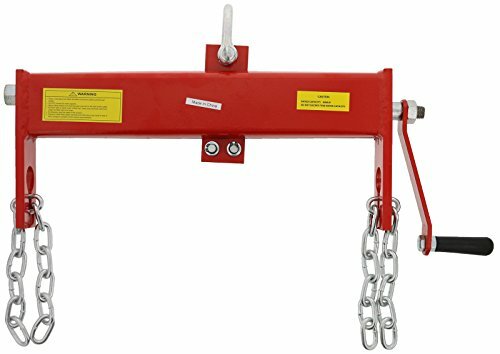 When the engine is being attached to the hoisting chain, the attachment should be firm, and the hoist should be strong enough. The fasteners that attach the lifting chain should have a tensile strength that is greater that the weight of that engine. The sling should be long enough, such that when the engine is being hoisted, there is a 45-90 degree angle at the top.